Outdoor 2cm porcelain pavers are a relatively new product category that has been added to outdoor pavers. These porcelain pavers are specifically designed for outdoor applications and provide the marketplace with a more aesthetically appealing alternative to traditional looks offered by concrete and brick pavers. Because digital printing is available on porcelain tile, virtually any look can now be achieved outdoors. These include various wood, natural stone, and concrete looks. Standard thickness indoor tile is typically between 8mm-10mm in thickness. Outdoor porcelain pavers are 2cm thick, or 20mm. 2cm porcelain pavers are designed and manufactured, specifically with exterior use in mind. Because they are twice as thick as standard porcelain tile, breaking strength and impact resistance is increased. Typically, the Dynamic Coefficient of Friction (DCOF) rating is also considerably higher, and sometimes so is abrasion resistance. But, many architects and designers have often wondered: Given its durability, couldn’t standard thickness porcelain tile be used in outdoor applications? The answer is yes, it absolutely could be. But – it is best to use standard thickness tile in a covered area that will not get wet. These are some simple guidelines to help you choose when each product type should be used in exterior applications. Use when pavers are being installed on pedestals to create an outdoor raised floor. The thicker tile is heavier than standard thickness material, so the weight of the unit will typically hold itself in place with little to no movement, and no adhesion. A 24″x24″ nominal size porcelain paver weighs nearly 40 lbs., while the same size standard thickness tile weighs less than 20 lbs., on average. A thicker tile with more strength is ideal when a cavity beneath the tile is present, such as the one a pedestal would create between the underside of the tile and the substrate. Use in exterior applications with direct exposure to weather and/or high foot traffic, or in pool areas. There is less risk of slip and fall with the typically higher DCOF ratings of 2cm pavers. The thicker material is also more durable and less likely to break. Use when you want to put porcelain over a flexible subbase. This application requires a sand set or install on an engineered mat system. The thicker, heavier porcelain lends itself much better to a successful, durable system. Use when wet setting with a tight total system thickness allowance. Perhaps there is a pre-existing slab you want to add a finish to, but there is an adjacent door threshold not yielding much clearance. In a case like this, please call us so we may assess and make the best product recommendation. You are limited to a rigid sub base with this method. Use in covered areas protected from the elements. 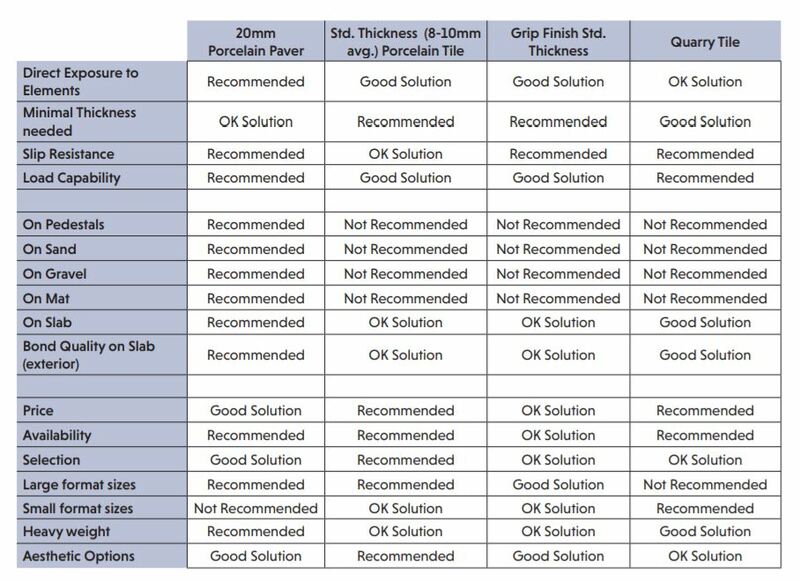 Standard thickness tile provides adequate durability in these settings and can save money vs. pavers. Use if you need to achieve minimal thickness (standard thickness is much thinner at 8-10mm). Use exterior rated, high slip resistance tile products such as quarry tile or R11 grip finish surfaces in uncovered applications. Perhaps there is a low maximum weight requirement, or a smaller format solution is required. Note that lead time and cost can quickly become a factor with certain types of specialty finishes, and large minimum quantities may be required. The Creative Materials team understands that all projects have different requirements. Creative Materials regularly consults with architects and designers to determine the best solution to meet specific project needs.